From left Bangkok United midfielder Anthony Ampaipitakwong and coach Mano Polking and Hanoi coach Chu Dinh Nghiem and forward Nguyen Van Quyet during yesterday's press conference. 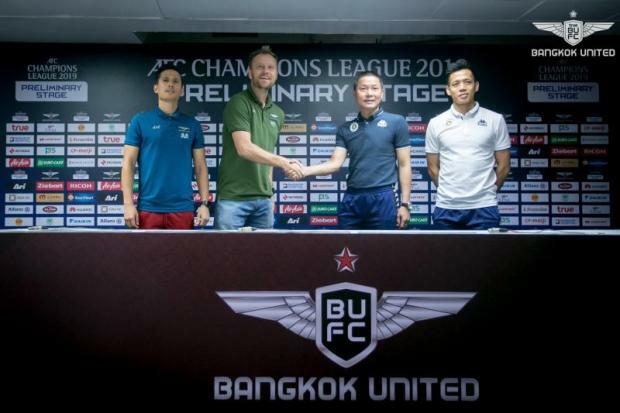 Thai clubs True Bangkok United and Chiang Rai United will be in action in the AFC Champions League play-offs tonight. Thai League 1 runners-up Bangkok United will host Vietnamese champions Hanoi FC at Thammasat Stadium, while Chiang Rai are at home to Myanmar league winners Yangon United at Singha Stadium. Both are one-off play-off matches and kick off at 7pm. The winners of this round will reach the third and final play-off phase for places in the group stage. Thai League 1 champions Buriram United are the only Thai team to earn a direct entry to the continental club championship. Bangkok United coach Mano Polking told a press conference yesterday that his men are ready for the encounter. "The atmosphere in our team is good and every player is excited," Polking said. "Hanoi are a strong team and have many Vietnam international players. Many of them won the AFF Suzuki Cup with Vietnam so their confidence is high. But we also have many Thailand international players. So we can't blame anything but ourselves if we lose." Chiang Rai United are returning to the ACL after missing out on a place in the group stage last season. But Chiang Rai could not have asked for worse preparations for today's game as the Beetles announced yesterday they had parted company with coach Jose Alves Borges. Borges only joined Chiang Rai United after the end of last season. He succeeded fellow Brazilian Alexandre Gama, who guided Chaing Rai to win the FA Cup and League Cup titles last term and is now coach of the Thai U23 side. Borges' assistant Elton dos Santos has been appointed to take charge of the team. Chiang Rai captain Peerapong Pichitchotirat said: "We are looking forward to the match. We will do our best to reach the next round. For the change of coaches, there should not be a problem. Elton knows the players well."